We proudly support Malaria No More as part of a global effort to put an end to malaria. We believe gin is only as good as the tonic water it's paired with. 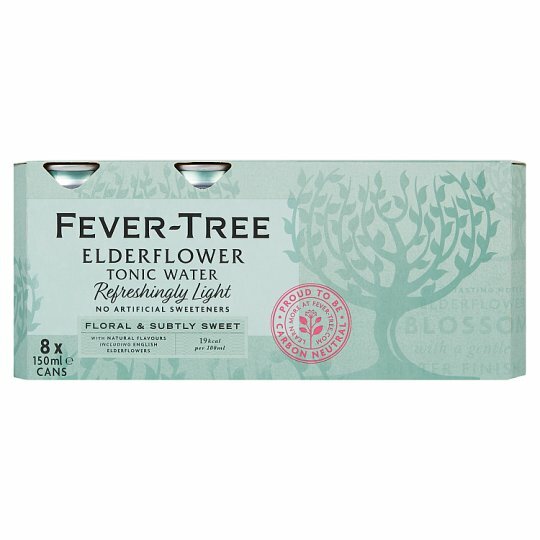 That's why, at Fever-Tree, everything we do starts and ends with taste. In our quest for the perfect tonic water, we spent days in the British Library researching quinine sources before travelling to some of the most remote parts of the world, venturing as far as the Democratic Republic of the Congo to find quinine of the highest quality. By blending the gentle bitterness of quinine with fruit sugars and the delicate, sweet notes of elderflowers that are handpicked in Gloucestershire, we've created a delicious, reduced and calorie Elderflower Tonic Water. A refreshing floral variation of our Premium Indian Tonic Water but with 32% fewer calories. Enjoy this summery twist on a classic G&T or as a sophisticated soft drink. Store in a cool, dry place., Best before end: See base of can.